Spend this Valentines Season with love and the smooth sound of Grammy Award winner PEABO BRYSON as he returns to Manila to headline LOVE ROCKS! For one night only, fans can catch Peabo Bryson, “The King of Balladeers,” live in concert, Tuesday, February 13, 2018, 8:00pm at Resorts World Manila, Newport Performing Arts Theater. International recording artist J MICHAELS also returns to NPAT as co-headliner and host of the ongoing Love Rocks! concert series. 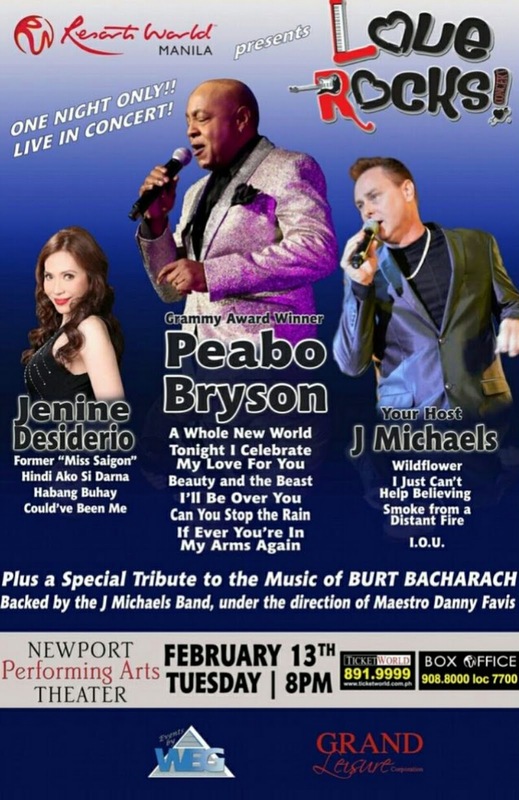 Former Miss Saigon JENINE DESIDERIO will complete this fantastic lineup as special guest artist, all backed by the J Michaels Band under the direction of Maestro Danny Favis. The theme for the evening will also include a tribute to the music of Burt Bacharach, with each artist performing their favorite Bacharach tunes. Bryson was among the premier silky-voiced soul artists who emerged as the softer, more sophisticated urban contemporary sound became dominant in the '70s and'80s. He made hit duets with Natalie Cole, Roberta Flack, Melissa Manchester, and Lea Salonga. Bryson enjoyed more success with “If Ever You're in My Arms Again,” “Can You Stop the Rain;” “Through the Fire” and “Unconditional Love.” Bryson won his first Grammy® Award in 1992 for his performance of the song "Beauty and the Beast" with Céline Dion. His second Grammy was awarded the following year for "A Whole New World" (Aladdin's Theme) with Regina Belle, being the only Disney song to make it to the Billboard top 100, and topping it at #1. With his tremendous crossover success, Peabo has transitioned into a world of international acclaim. Peabo Bryson is, at his intimate best, a legendary vocalist offering a timeless mix of pop and soul as only he can. Bryson has amassed a loyal fan base, critical acclaim and an avalanche of awards by being one of the “truly best friends” a song could ever have. This Love Rocks! Concert is presented in cooperation with Grand Leisure Corporation and Events by WEG Inc.